Prom tickets must be purchased by Monday, April 15th. The cost is $35 each. See Mrs. Burnette or Ms. Falkner to pay. Thursday Athletics - JH Baseball plays at Pocola at 3:30pm. HS Baseball plays at Gore at 1pm. 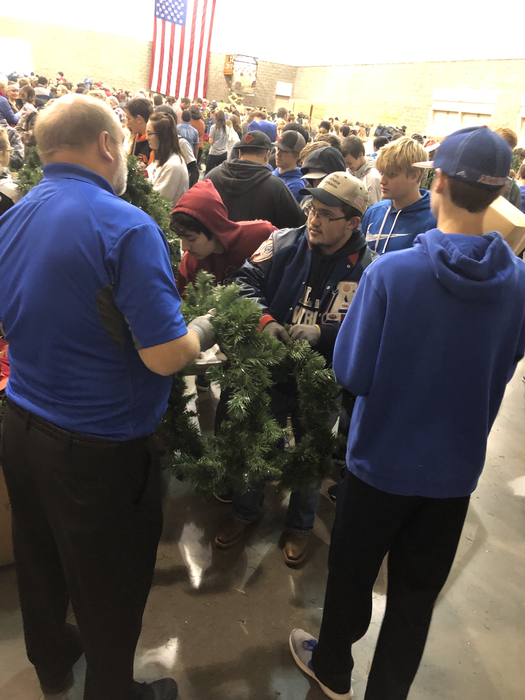 If you sold Blue & Gold, please see Ms. Falkner tomorrow to pick it up. HIGH SCHOOL PARENTS: Today we sent home a parent survey link. 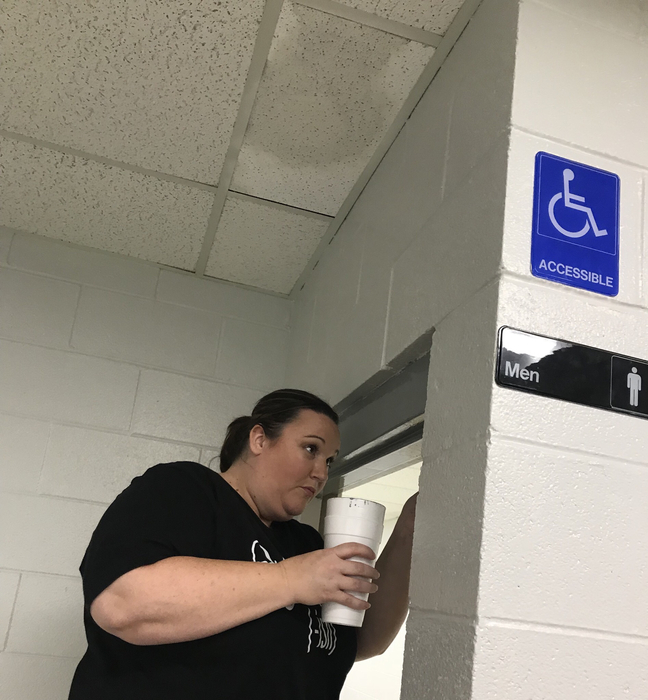 We as a district are looking at making some changes for next year. We would appreciate your feedback on this survey. If you have questions, please contact Mrs. Walden. 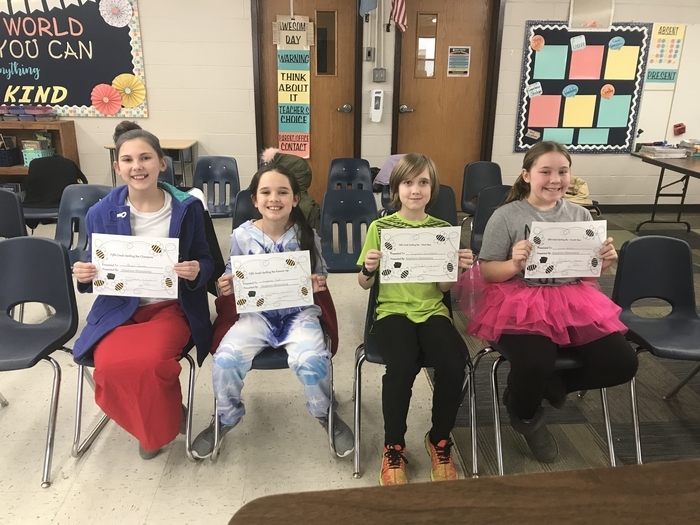 If you see these girls around town, tell them congratulations! 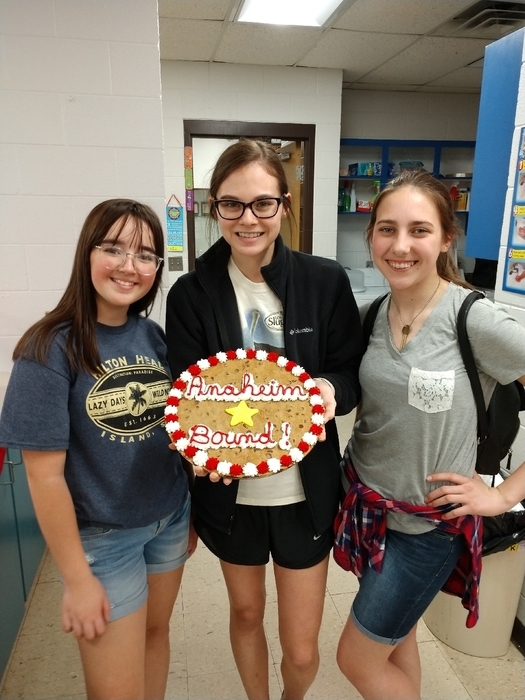 All three qualified to compete at the National Leadership Conference in Anaheim, CA! 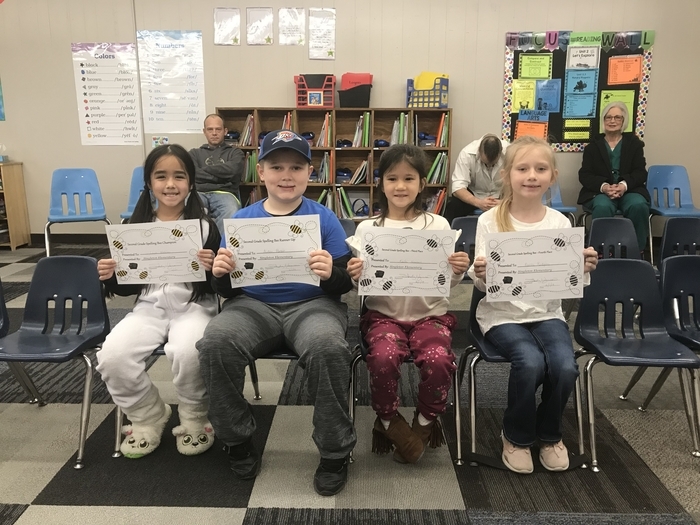 Good job, Katie, Bella, & Haven!!! 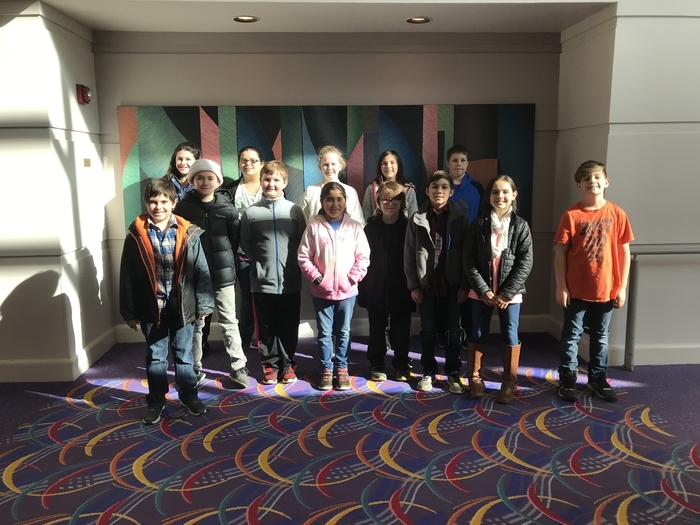 Did You Know.....All Choctaw students who have a tribal membership card qualify for a $100 retail gift card through Choctaw Nation. If you would like to apply, give Sean Lundquist a call or you can apply online at choctawnation.com. Must apply by May 1st and be between 3yrs old and 12th grade. 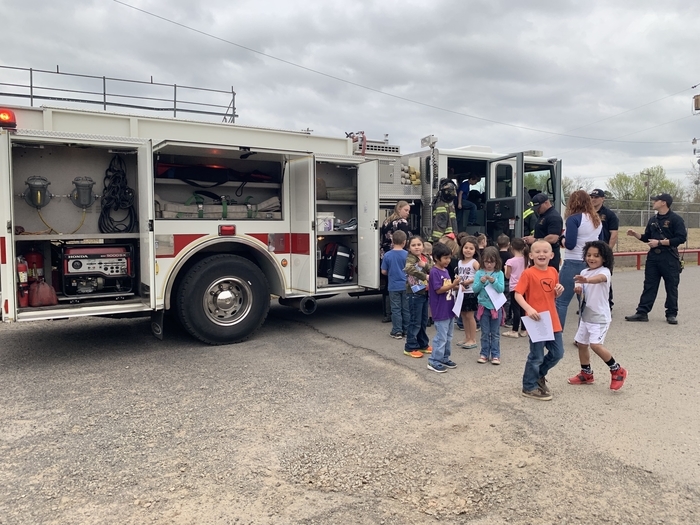 Transportation Day at the elementary. Baseball start time is 3:15 today due to the threat of inclement weather. 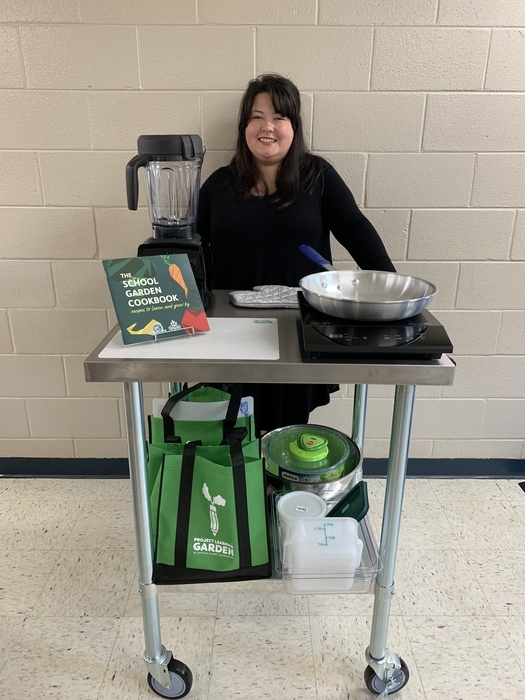 Ms. Willard is so excited to receive her mobile cooking cart today! 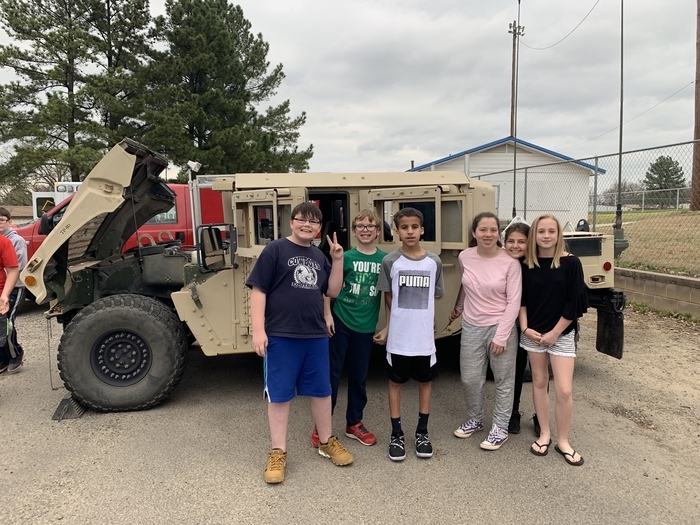 She received the cart as part of the Captain America grant she applied for earlier this year. 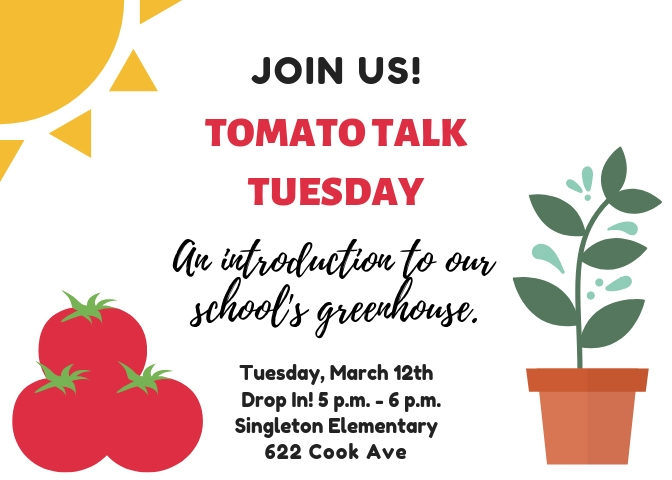 Students will have cooking lessons and demonstrations using the crops out of their school garden. No HS Baseball @ Arkoma Thursday, March 28. Jr. High Baseball plays a doubleheader @ Pocola at 4pm. 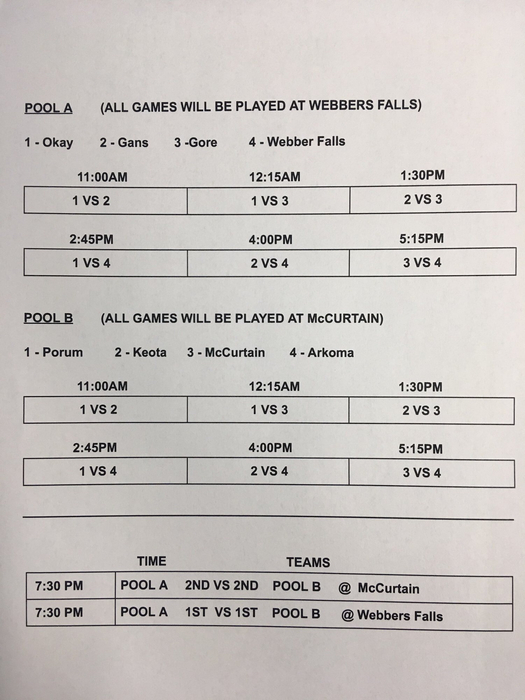 Lady Mustangs Softball will be playing at 5:30pm - 2 games @ McCurtain 5:30 vs Webbers Falls and 6:30 vs McCurtain. Let’s all go support our girls. Now taking applications for certified JH Math teacher. 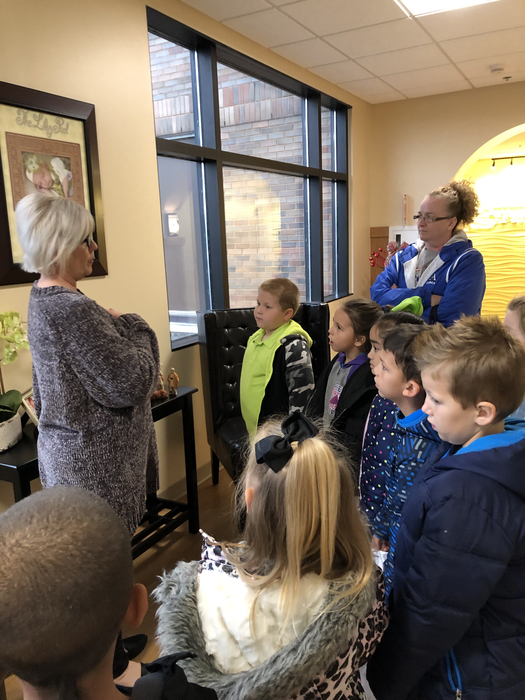 We offer small class sizes, good resources, and support. 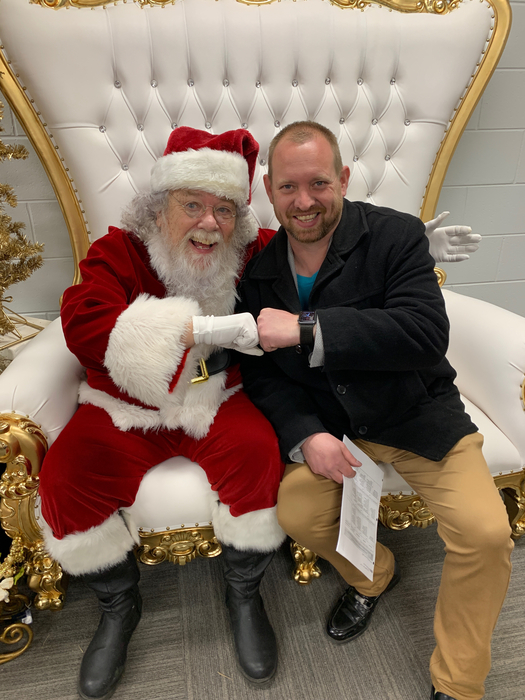 Possible coaching duties available. Email resume, copy of certificate and references to: cwalden@arkoma.k12.ok.us by May 1st. Job may be filled sooner than May 1st. 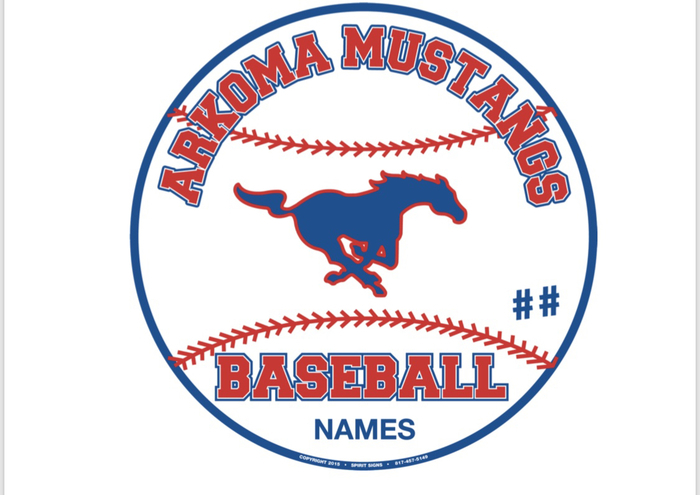 The Mustangs will play at ARVEST Ballpark Monday, March 25 @ 5pm vs NWA Home School. Free entry to this game. Temperature upper 50s with NNW winds 10-15 mph. Come on up and support the Boys. 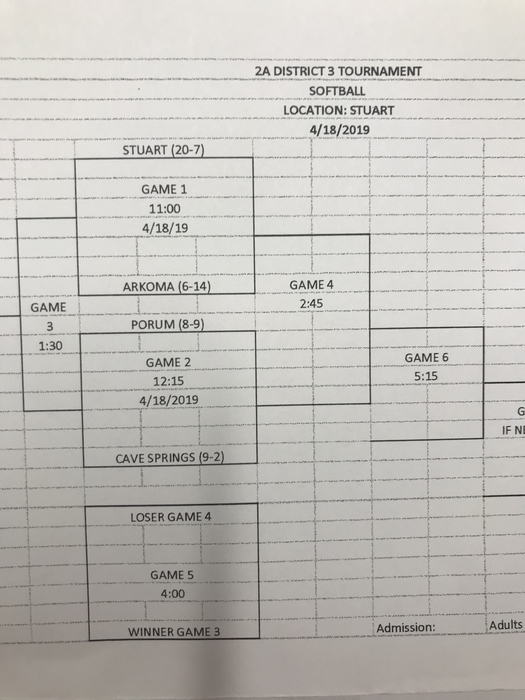 The Mustangs Baseball team will be playing at Central Sallisaw Friday, March 15 starting at 3pm. If you can’t make it to the game, catch all the action live on TIFS - Today in Fort Smith (Facebook) with Dennis McCaslin. Due to absences, Elementary SHOW CHOIR practice will be cancelled this afternoon!! Sorry for any inconvenience! All softball and all baseball games are canceled today. Just a reminder the Book Fair is going on this week at the Elementary school!! If sending money with your child, remember that all items are taxed. Elementary phones are now working!! Thank you for your patience! Elementary phones are still down. We will let you know when they are fixed. Sorry for an inconvenience!! Book Fair is this week! Monday-Friday, 9am-2pm. Books for ALL ages! Everyone is invited!! Cheer Tryouts Clinic today 3-5 in elementary campus gym. Our Elementary phones are currently not working. The phone company as been notified and we apologize for an inconvenience. Elementary phones are not working. Hoping to resolve issues soon. Come check out our new garden area! Can take home a plant and gardening information for your own garden. 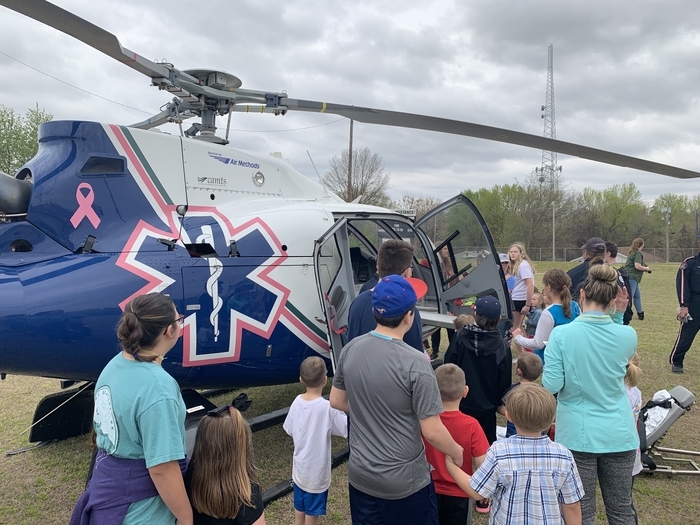 Students, parents and Arkoma residents are encouraged to come. The school phone system is not working. We have notified the phone company and hope to have this fixed ASAP. Juniors & Seniors if you would like to sell Blue & Gold to pay for your Prom ticket, you can pick up a form from Ms. Falkner. 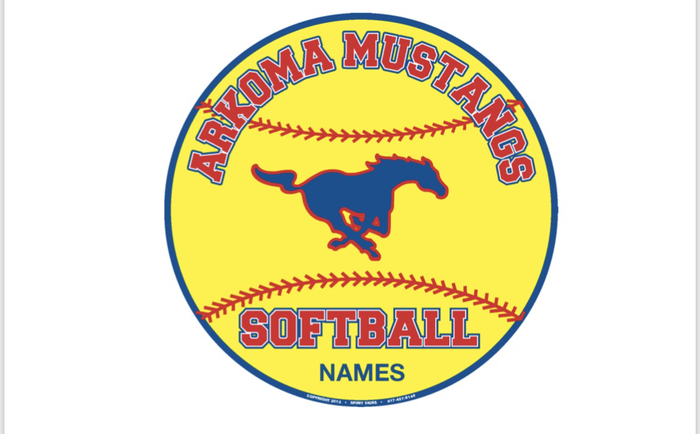 Lady Mustangs Softball- host Cameron Thursday - starting at 4 There will not be a Jr. High game. 2 HS Varsity only. Calculators are now available to check out through the office Monday-Friday for JOM students in grades 6th-12th. There are 24 calculators and they will be a first come, first serve basis. 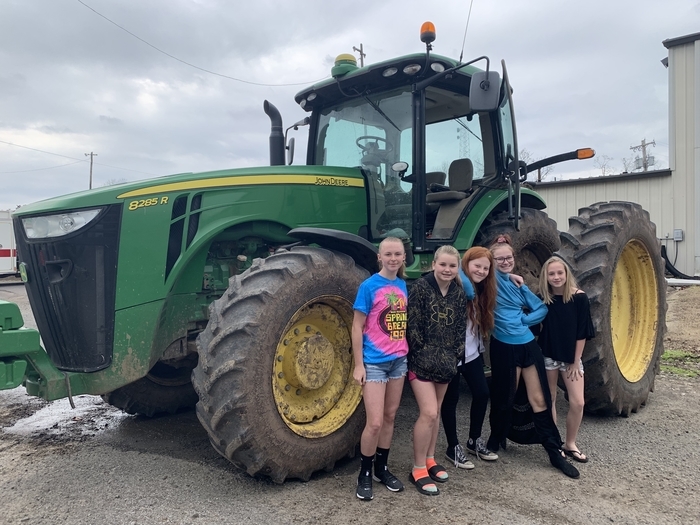 Students who would like to check one out, must have signed wavier form turned in to Mr. Sean. Softball & Baseball Yard Signs on sale now! $20 each and last several years!!! 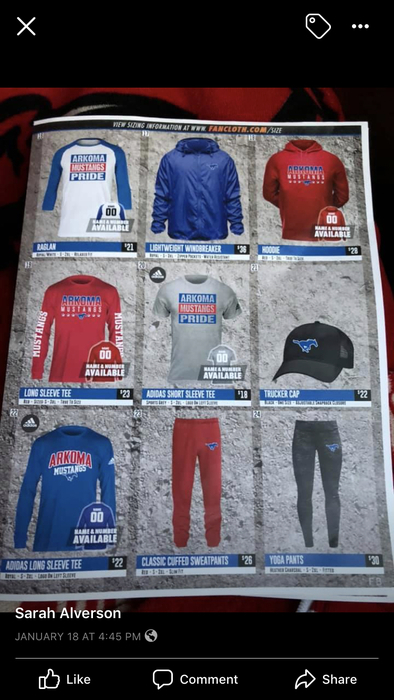 Order forms will go out Wednesday or can be picked up at either campus office. ALL ORDERS DUE WEDNESDAY, MARCH 13TH BY 3PM. HS Baseball @ Howe will start tomorrow at 3:30 due to weather. 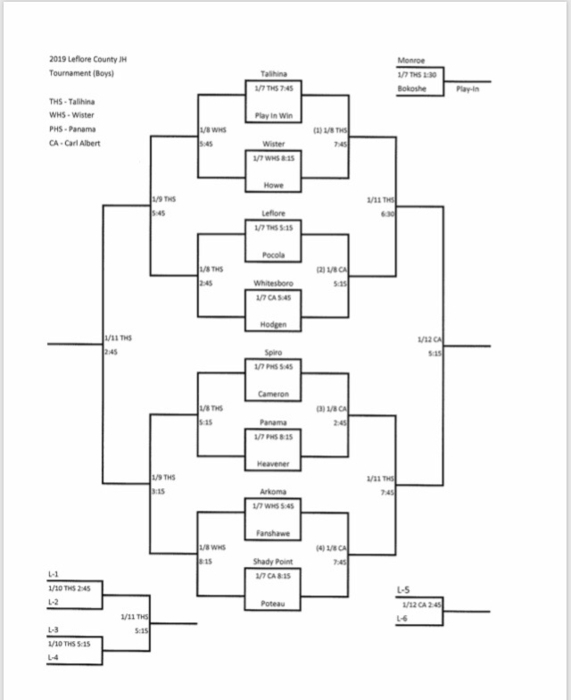 HS Softball will start at 3:30 @ Arkoma due to weather and three teams playing. Wrap up and let’s support these teams. Baseball and Softball games for Monday are canceled. 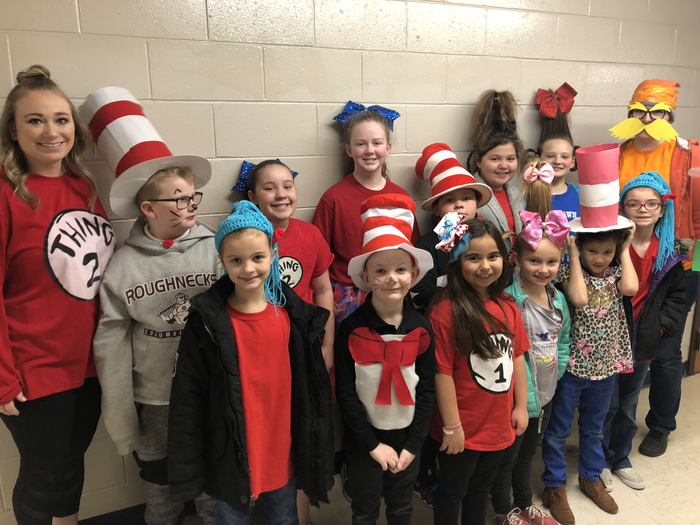 Elementary students celebrated Dr. Seuss Day on Friday. 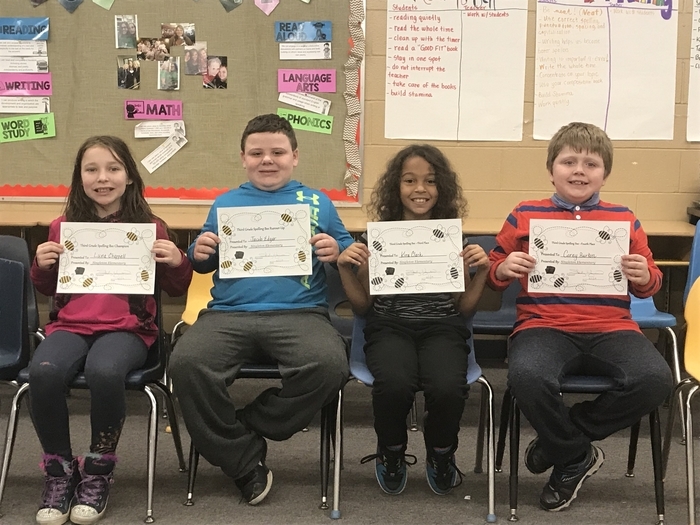 Older students read Dr. Seuss books to younger students, the cafeteria served Green Eggs and Ham for breakfast , and many more Dr. Seuss activities took place! We are considering offering a FAFSA night for senior parents. Would this be something you as parents would take advantage of? It would be one evening. 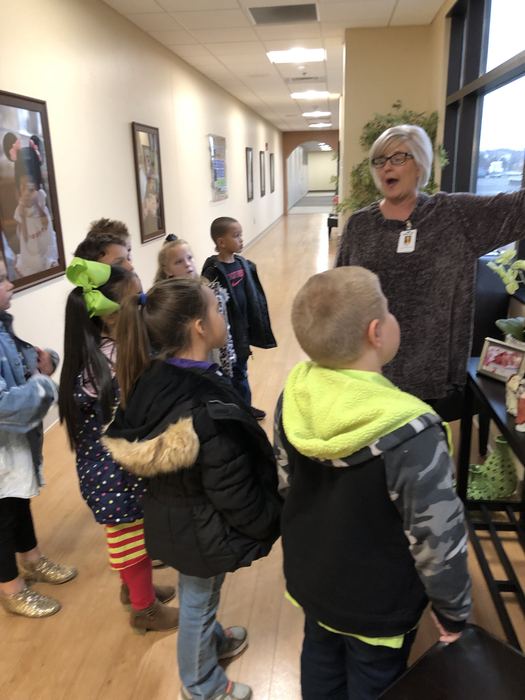 A lady from the Educational Opportunity Center at Carl Albert would come to the school and walk parents through the FAFSA application process. Please comment below or contact Mrs. Walden if this is something you would like for us to schedule. JH-HS Baseball @ Porter 4pm Monday, Feb 25. HS Baseball @ Gore 4:30pm Tuesday Feb 26. HS Softball Scrimmages Tuesday at Cameron, Thursday at Poteau.and JH-HS Baseball @ Cameron 4pm Feb 28. JH-HS Softball hosts Warner Friday, March 1 starting at 5pm. Let’s go support all our teams. 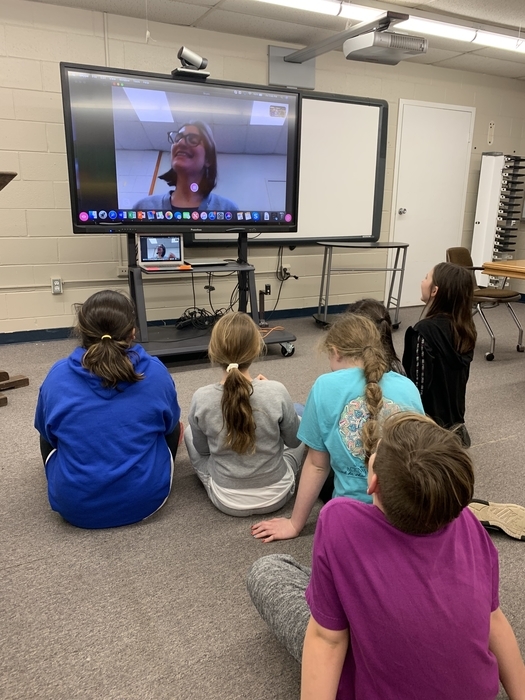 5th/6th grade GT students participated in “Skype a Scientist” today. 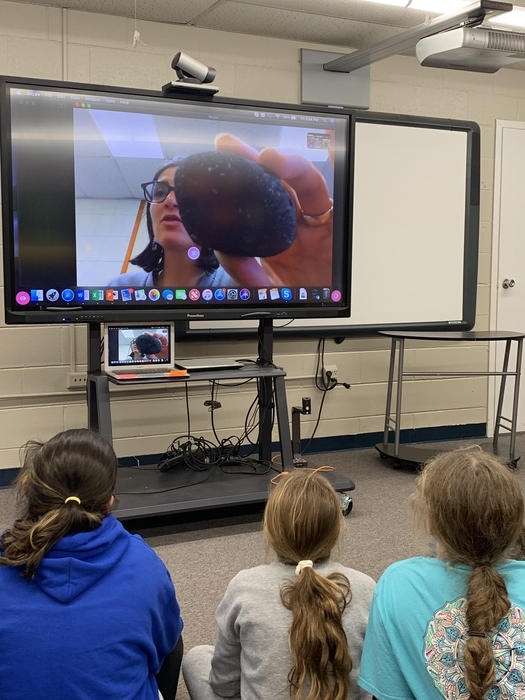 Students spent about an hour visiting with Ayla Pamukcu, a geologist. More specifically, she is a volcanologist/igneous petrologist who studies volcanoes and volcanic eruptions. 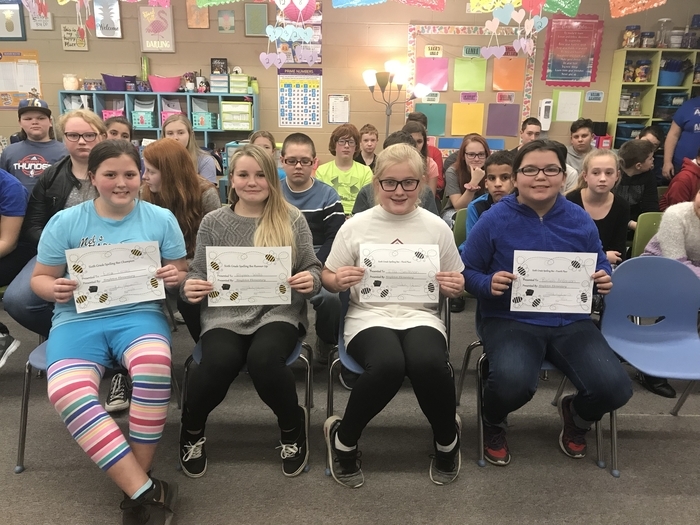 She discussed many places around the world that she has visited while studying volcanoes, her favorite being Antarctica. The most interesting fact that our students learned was that Arkoma was deep in an ocean long ago! JH & HS Cheer Clinic & Tryouts Announced: Sunday, March 10- Mandatory Parent meeting 3:00-3:30 Sunday, March 10- Meeting and clinic for those trying out (wear athletic clothing and shoes) 3:00-5:00 Wed, March 13- Clinic (students only) 4:00-5:30 Thurs March 14- optional clinic 4:00-5:00 Friday, March 15- TRYOUTS. JH 8am. HS 1pm $100 deposit due day of tryouts! 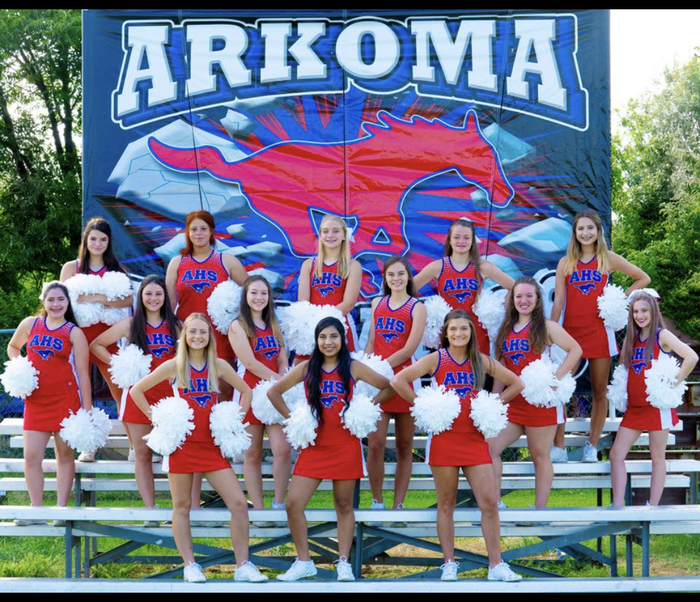 Tryout material will be posted on the Arkoma JH and HS cheerleaders Facebook pages on THURSDAY, March 7th. You need to know most of this material for Sunday’s clinic. 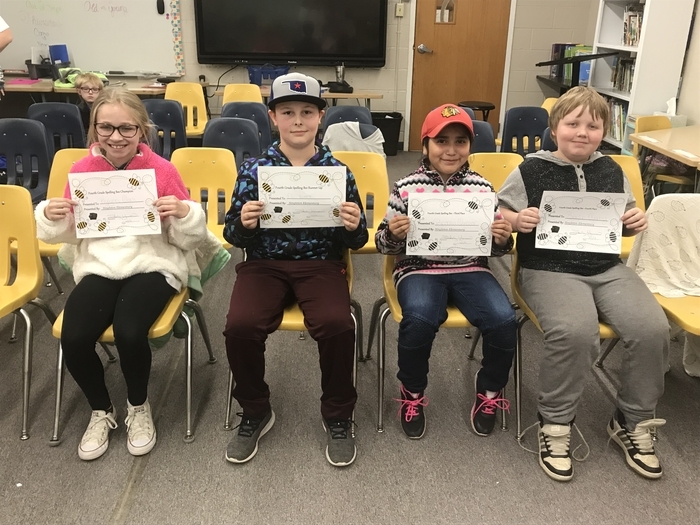 Singleton Elementary held their school-wide spelling bee today. 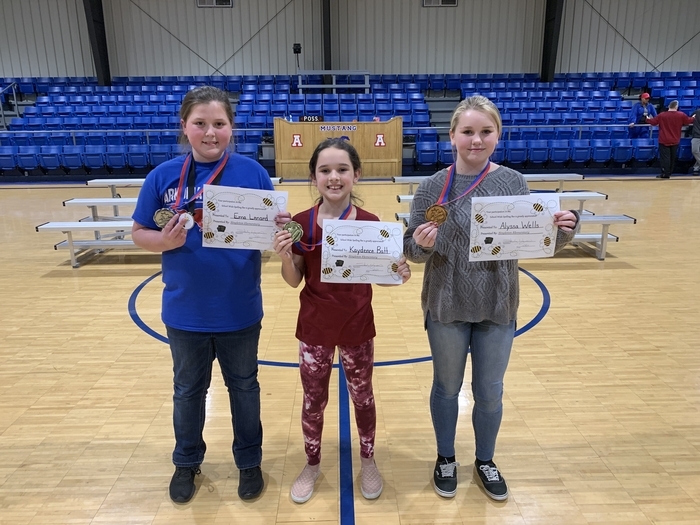 School Champion- Kaydence Batt School Runner-up- Ema Lenard Third Place- Alyssa Wells Kaydence and Emma will compete in Muskogee on April 5th. There will be NO school this Thursday. Congratulations to Katie Johnson, Haven Spoon, and Bella Thomas for advancing to State for FCCLA STAR Events! 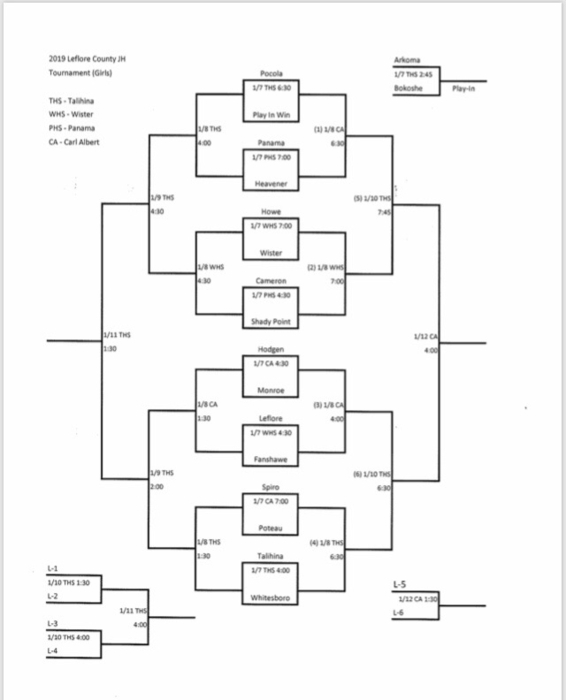 JH Conference Tournament - Arkoma JH Bus is leaving at 2:15. The girls play at 4 and the boys play at 7 - both games at Gore. 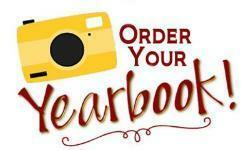 Yearbooks on sale now $35 through March 8th. Order forms are in the school offices and Mrs. Stacey Burnette's classroom! 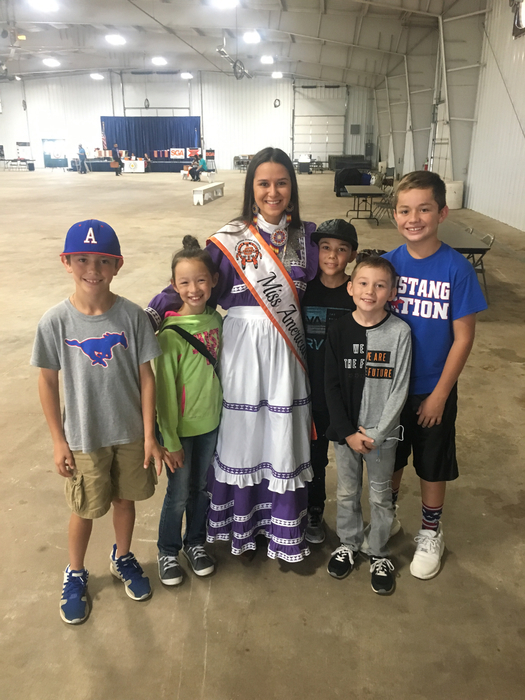 If you would like printable copies of the pictures taken tonight at homecoming, please email her at jodidjohnson@yahoo.com, and she will send you a Dropbox link to access the pictures. Ms. Jodi will post pics on Facebook, but they will not be in a print friendly format. If you have questions, please contact Ms. Jodi or Mrs. Walden at the school. 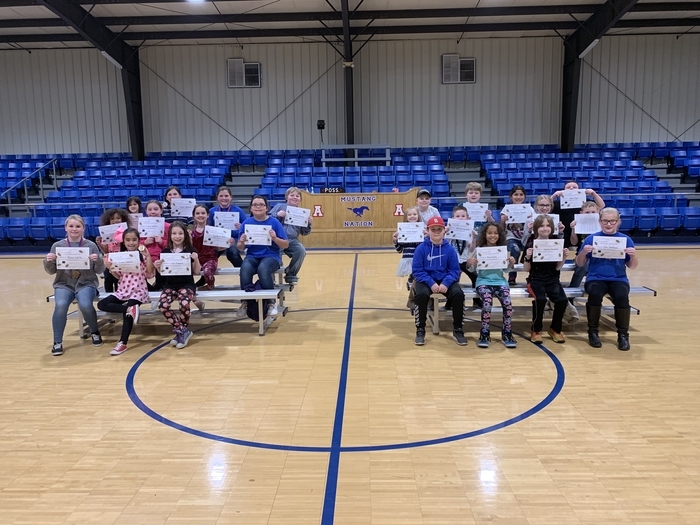 Tomorrow is Elementary Basketball and Pony Express pictures. Please send uniforms and shoes! $10 CASH if you want a memory mate! Due to County Tournament play, Thursday and Friday JH games have been cancelled. There will be NO Pony Express practice today!!!!! 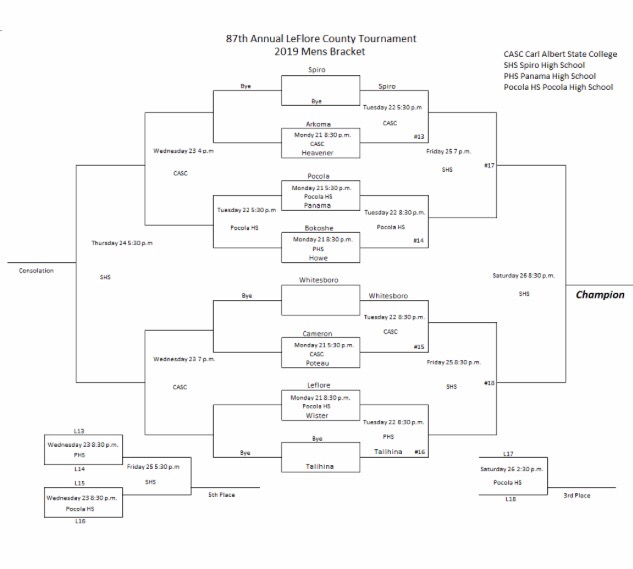 JV Boys play at 5:30 Friday at Porum. Varsity follows starting at 6:30. 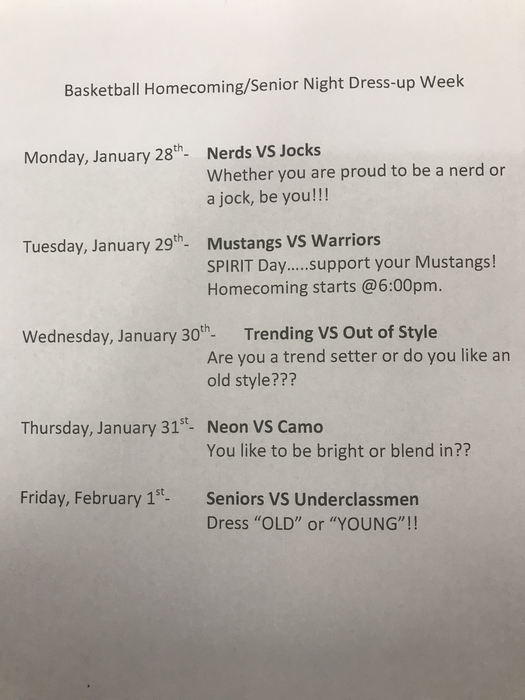 Due to Wister’s Homecoming, HS Boys will play first Friday night. Games start at 6:30 pm at Wister Gym. 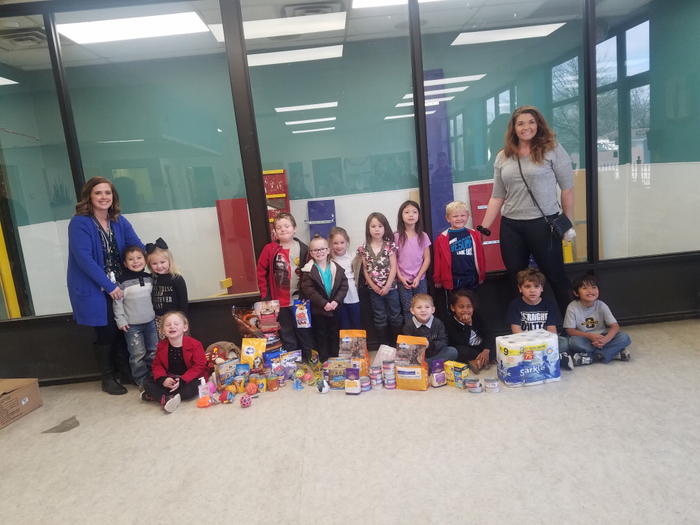 Pre-K and Kindergarten donate to the Humane Society in Fort Smith. The kids were so excited to deliver their goodies! 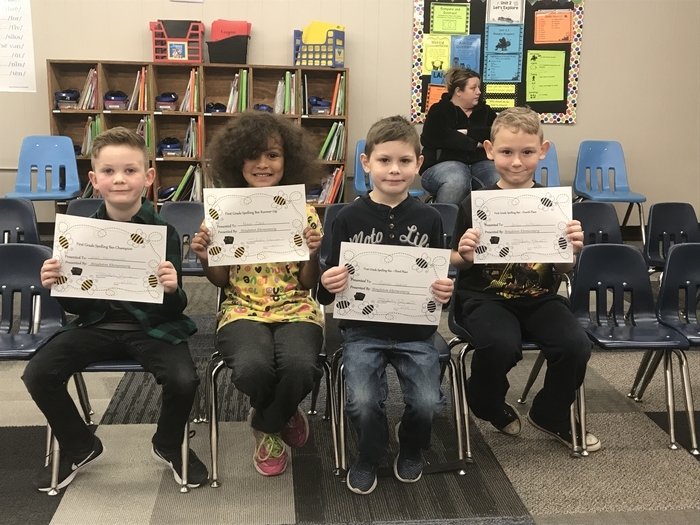 Pre-K students win “Sweet Treats” for donating the most tissues during the Elementary Tissue Drive hosted by the Student Council. 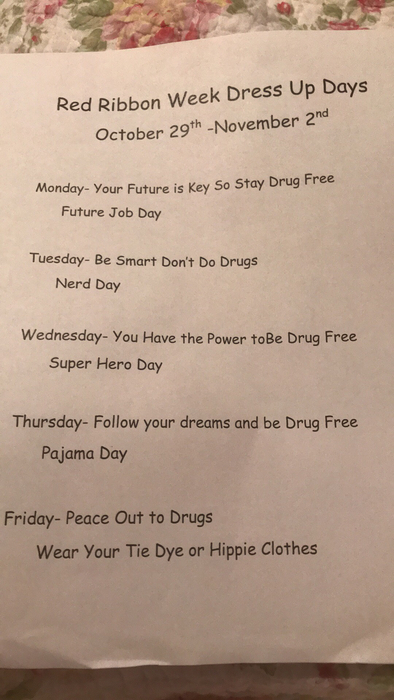 They will be so excited Wednesday! 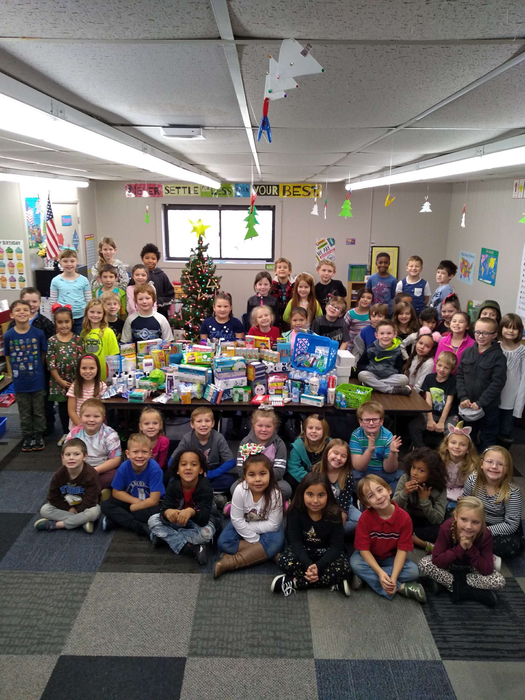 1st & 2nd graders donate to the Ronald McDonald House for Christmas! Monday’s JH games will begin at 5:30pm. There will be NO high school games Monday. December 17th JH games will start an hour earlier @4:30. They will be followed by make-up HS games against Okay. HS games will start @6:30. There will be NO Jr High or Sr High games Monday. 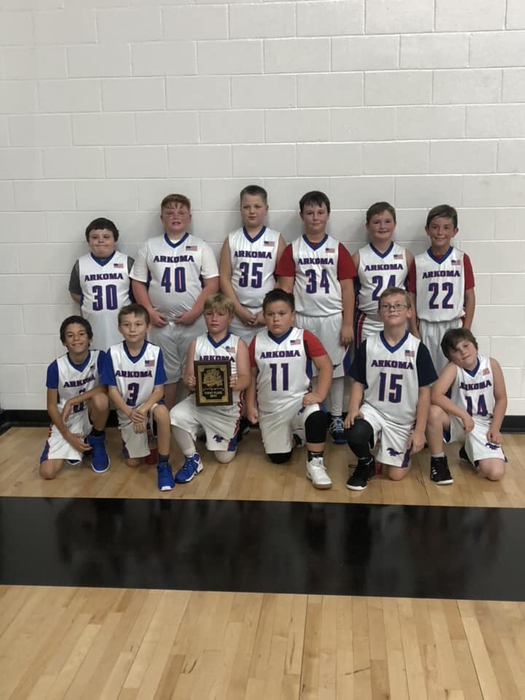 5th & 6th grade JV games Monday at noon vs Liberty. Pony Express will perform. Concession will be open! 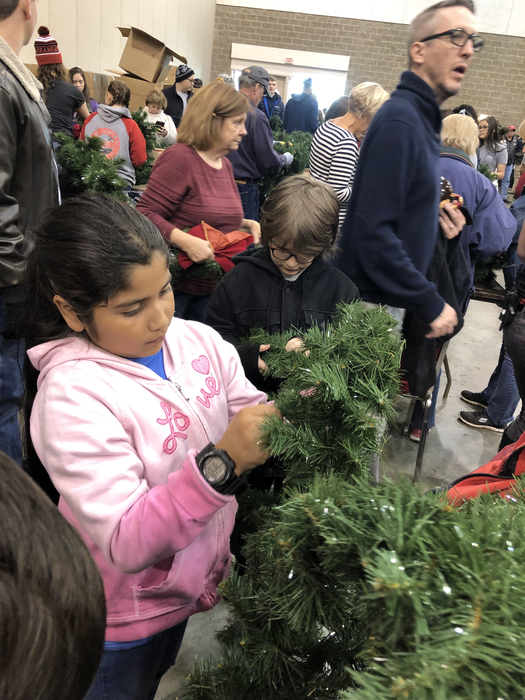 Instead of exchanging gifts with each other, our students pick local charities and donate to them. 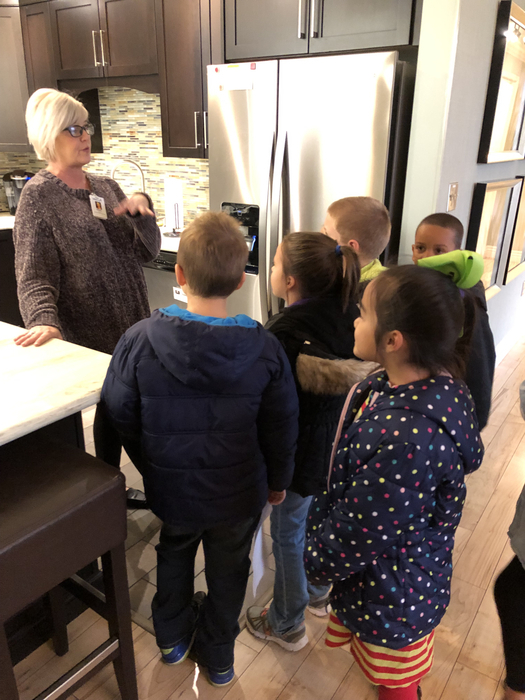 Some of our 1st and 2nd graders visited the Ronald McDonald House at Mercy Hospital today to learn about their mission and how they could help. Students will now gather items to donate next week. Anyone can donate, just stop by the school for more information! 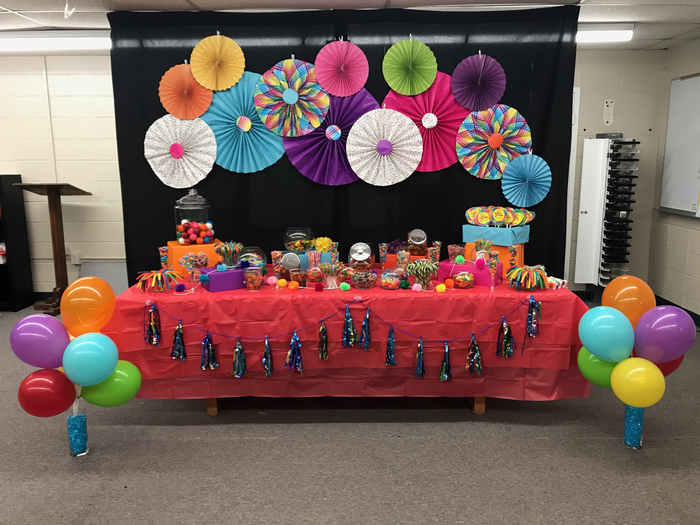 Miss Christy hosts Lunch in the Library DAILY with games, crafts and hot chocolate! High school students- come by !! 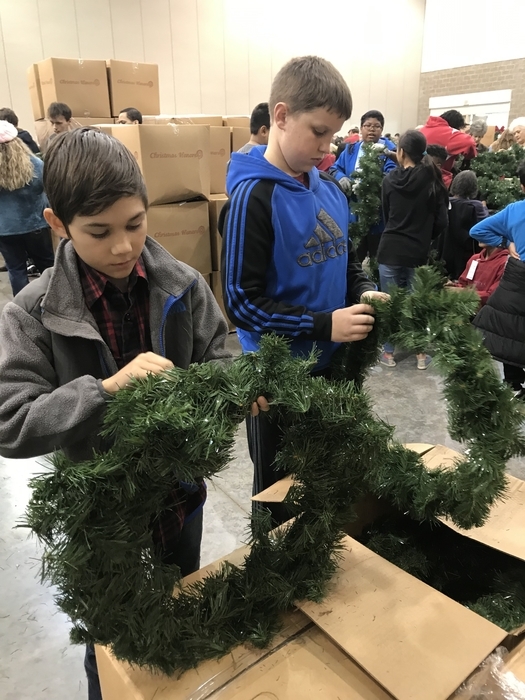 Elementary GT students have been studying about National Cemeteries and took part in today’s Wreath Workshop. 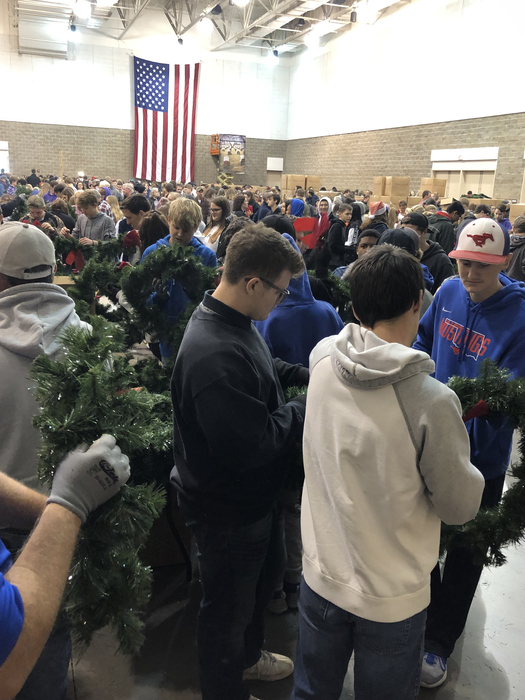 Students helped put wreaths together that will be put on the graves Saturday. Change in sports pictures for Monday: we will do JH basketball, HS basketball, JH and HS cheer ONLY. Elementary basketball and Pony Express will wait until January. $10 cash for an individual and a team photo. 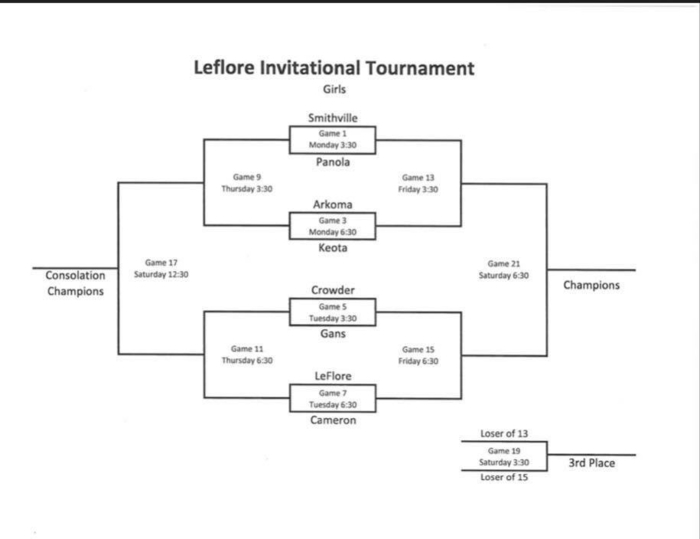 HS girls bracket for LeFlore Invitational Tournament! 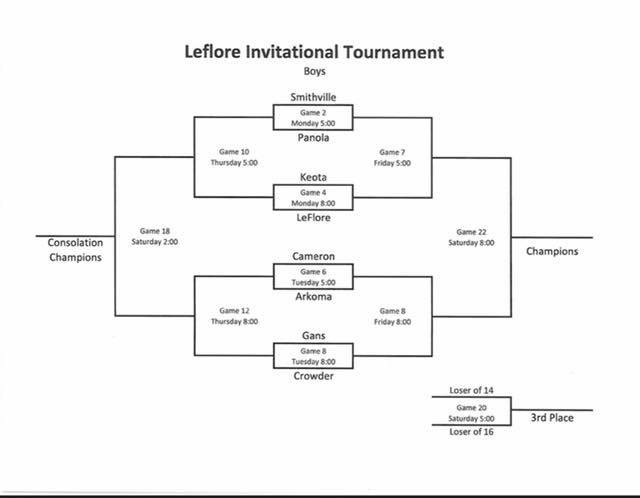 HS boys bracket for LeFlore Invitational Tourney. Today’s games against Okay have been cancelled. All games have been rescheduled for Dec. 10th. Football pictures are Monday! $10 CASH for an individual and team pic. Order forms will be given at photo shoot! Veteran’s Day program today at 10am in elementary gym. Everyone welcome! Tomorrow is the Veteran’s Day program. 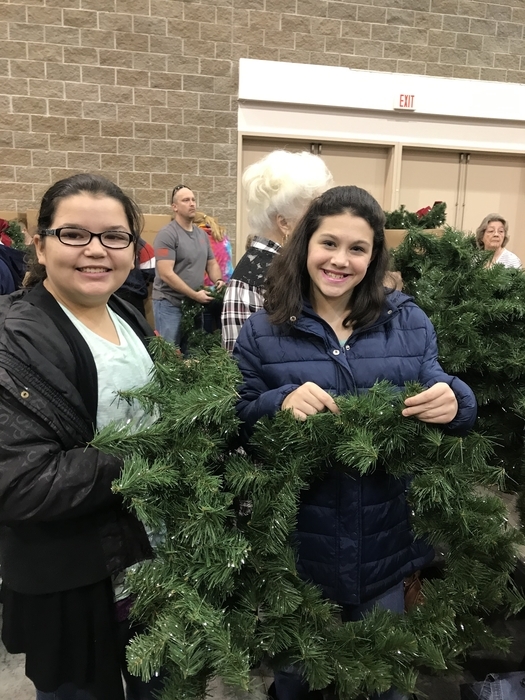 The program starts at 10 am in the Elementary Campus gym. Please invite anyone you know who has served our country! Hope to see you there! 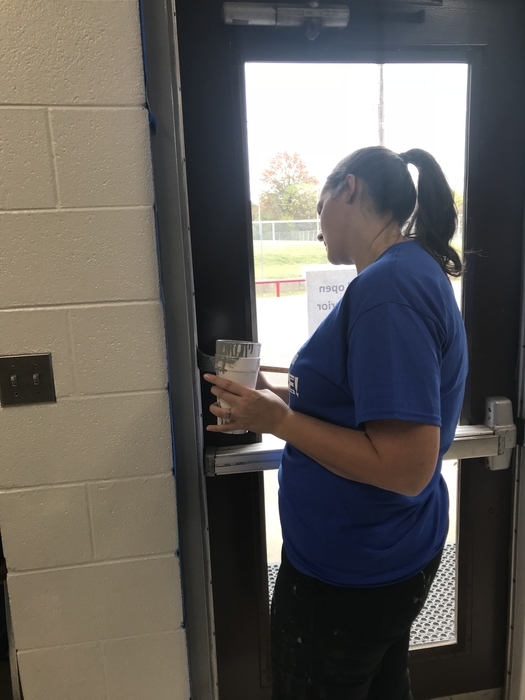 Amanda Johnson and Shannon Watkins volunteer their time to paint trim in the gym. Thanks ladies! Veteran’s Day program has been changed to 10am Friday. 3-6 basketball camp tomorrow 2-3 with Jim King is in Elementary Campus Gym. $10 if anyone is wanting to still enroll! Money due by 9am tomorrow morning. Taking applications for part-time cook position. 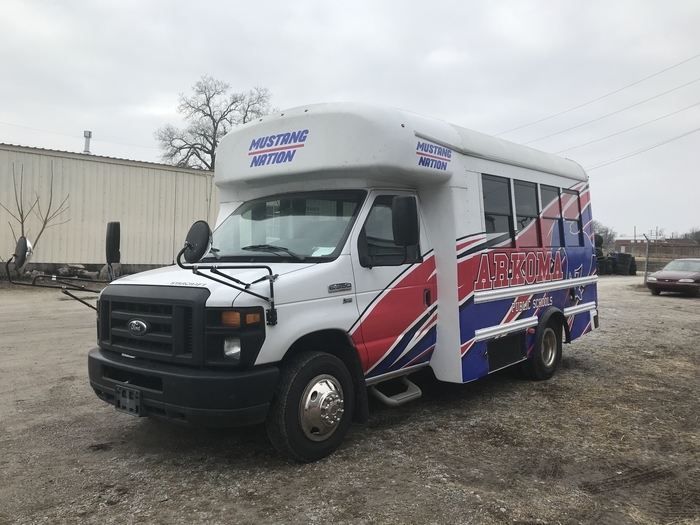 If interested please send email of interest to rharvey@arkoma.k12.ok.us Please state interest in job, amount pay desired, hours available to work and related experience to job. Winter Dress Code starts tomorrow. No shorts, sleeveless shirts or open-toed shoes. 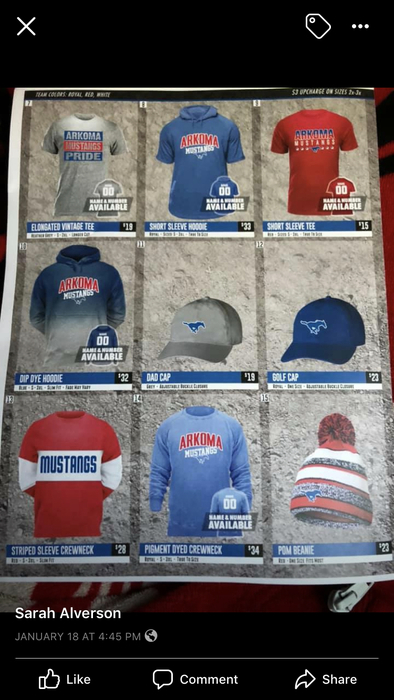 Order Forms going out Monday! The Veteran’s Day program will be 1:00 Friday at the elementary campus gym. All Cancer Awareness game is this Friday night vs Gans. HS Cheerleaders will have a special performance at halftime. Red Ribbon Dress Up this week at the Elementary! Fall King and Queen tickets are due by 3pm today! All 7th grade students need a pumpkin for art class by Friday, October 26th. Thank you!! 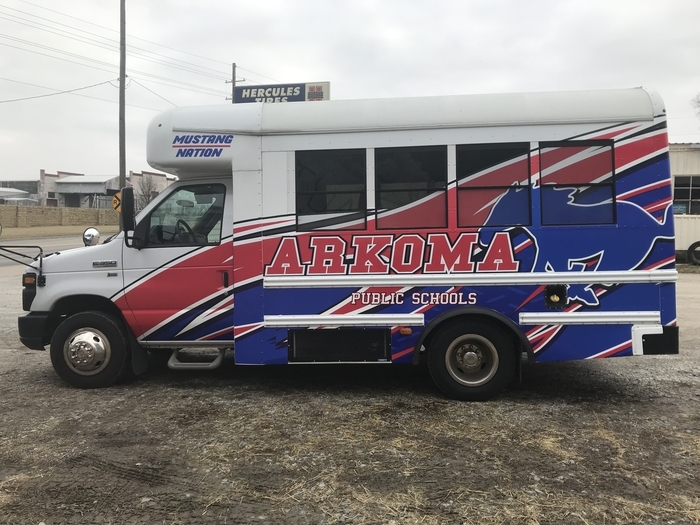 Arkoma Schools has a no pet policy, no pets in buildings or on school grounds during school time and school functions. Today’s elementary and junior high games have been cancelled! OFFICIAL POST: HOMECOMING IS AT 6PM TOMORROW. GAME STARTS AT 7:30!! 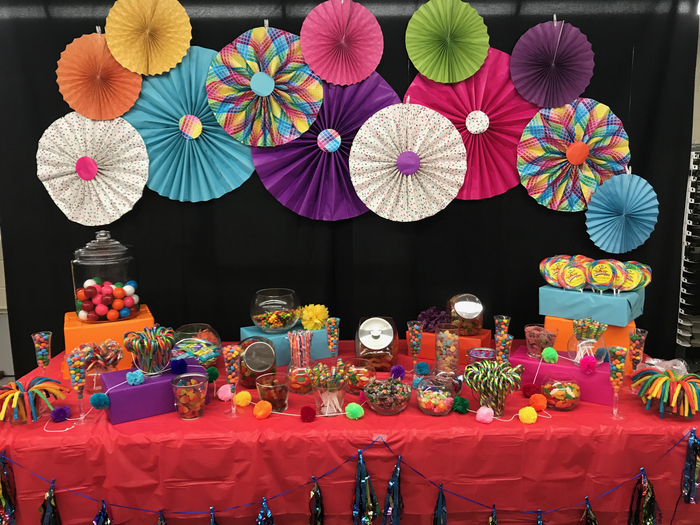 OFFICIAL POST: HOMECOMING IS AT 6PM TOMORROW!!!!! 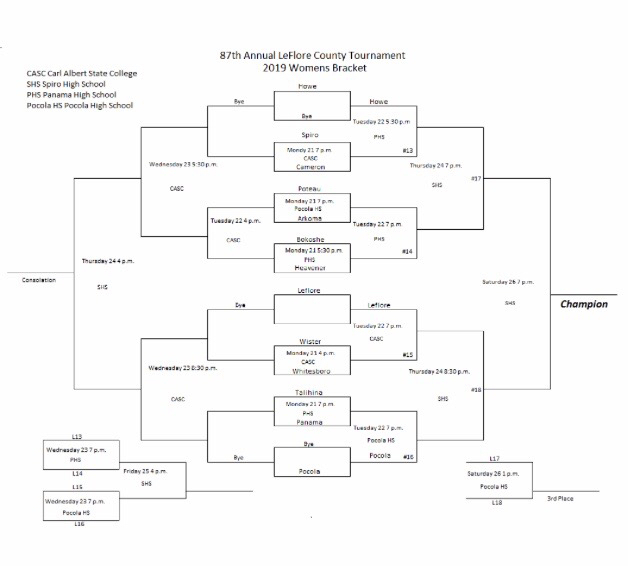 Tomorrow’s ballgames against Webber’s Falls will begin at 5:30! 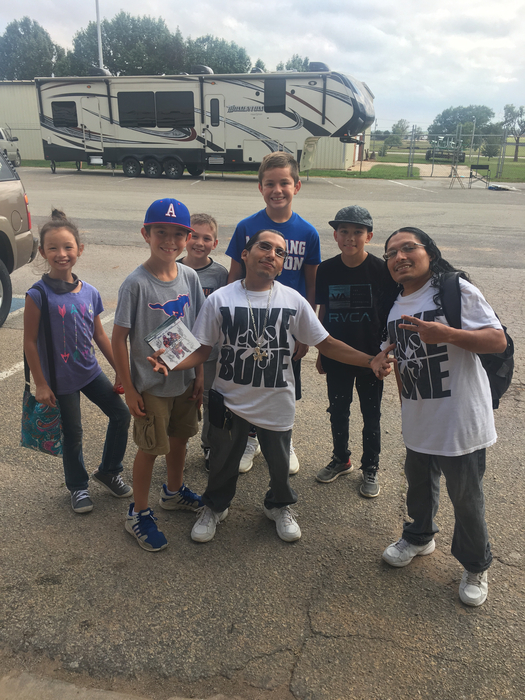 Arkoma JOM visits Pow-Wow in Stillwater Oklahoma. First meet under our belt! Was a success in many ways. 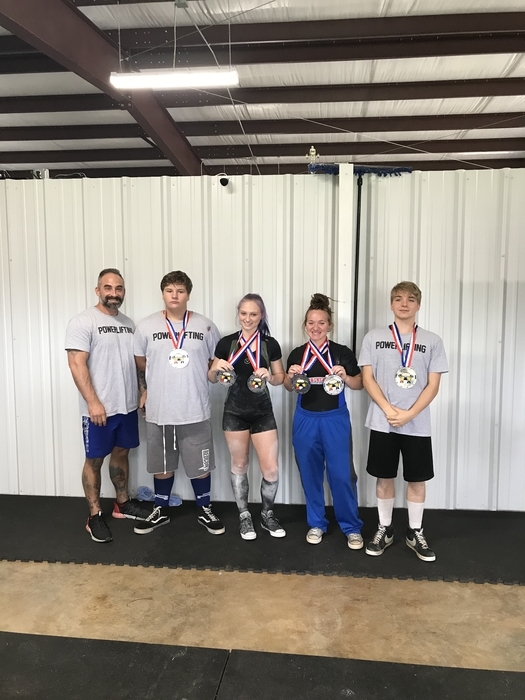 Arkoma students competing in Dyer Arkansas in powerlifting! Homecoming parade is Thursday, Oct 4th at 6pm. Students CANNOT drive in parade, adults only. To be in parade you MUST have a decorated vehicle or trailer. Contact Mrs Harmon to be in parade! 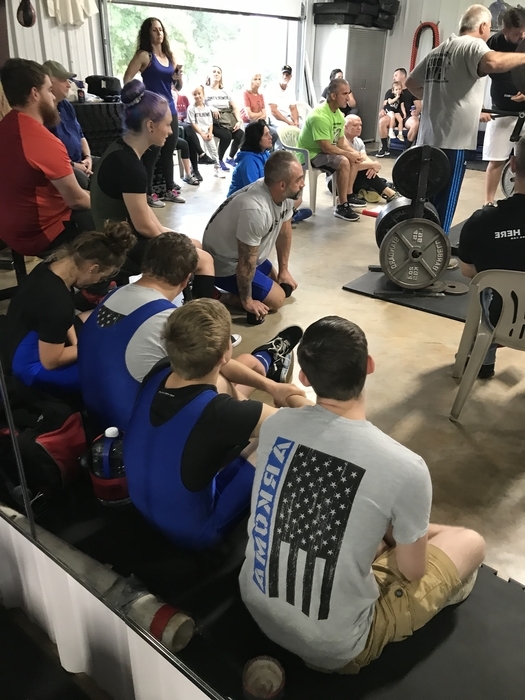 Some may not be aware, but we have an Arkoma Powerlifting team. They will compete in their first competition September 29th at 10 AM at Hudson’s Gym in Dyer, Arkansas. Come out, watch and support our Mustang Powerlifters! I know they would appreciate it. Due to the rain, there will be NO performance tonight for Pep Club or Elementary Cheerleaders!!! 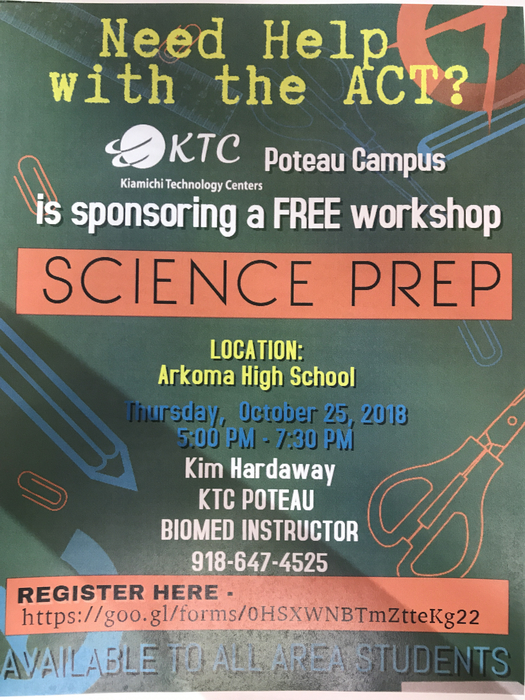 ACT Prep- sign up today! 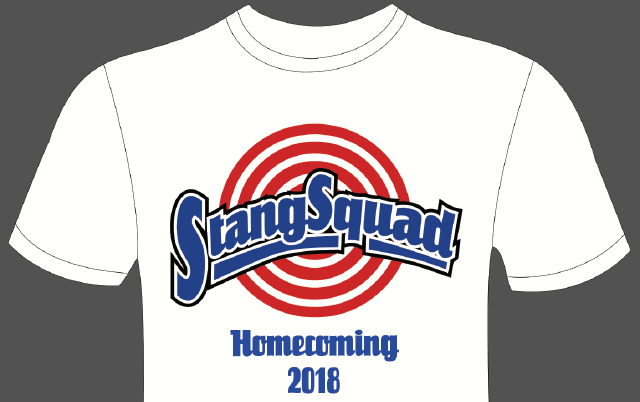 Homecoming Tshirts on Sale now $10. Due next Wednesday! 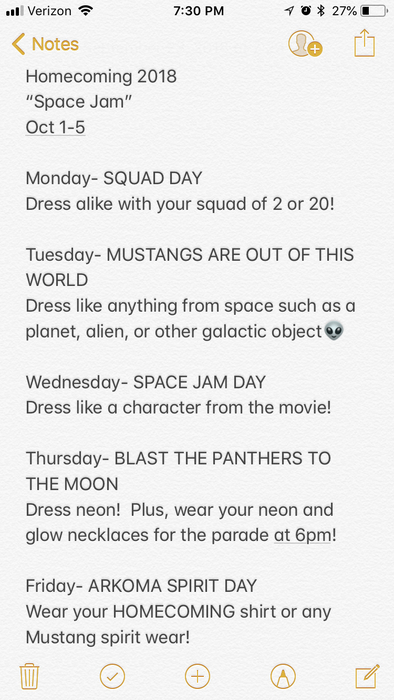 This year’s Homecoming theme is Space Jam! The JH is selling mums to raise money for winter formal. Mums are $20 a piece and anywhere from 18-30 inches. They will be yellow, white, red, pink, purple and orange. We will be picking up the first load Monday. 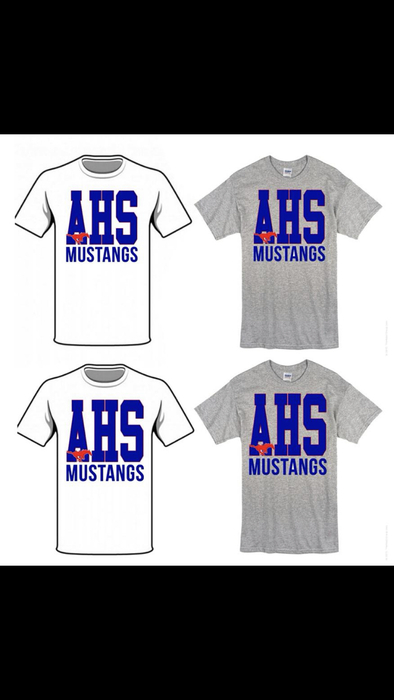 We will also have them for sale at Friday nights football game. Please go ahead and preorder on the FB post so we make sure we get enough on Monday. Thank you in advance for your support!! 5th-8th grade girls interested in running for Football Princess can pick tickets up this Wednesday! 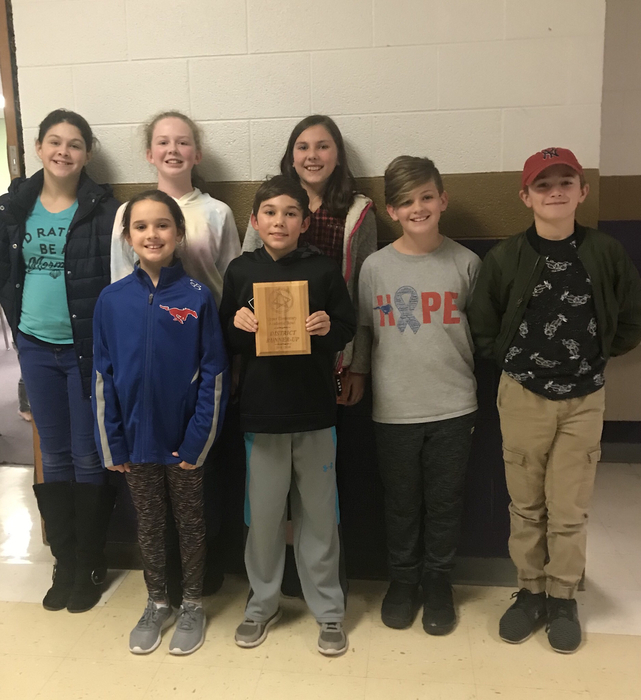 Today’s Elementary game at Gans starts at 5:30. JH will begin after that. Thursday, JH softball against Heavener starts at 4. 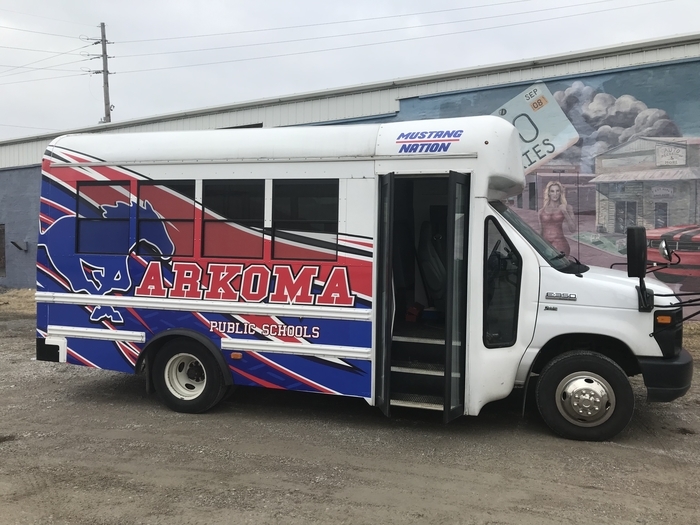 Be sure and check out the news stories on the Arkoma APP - these will also be on the new website that is almost ready to reveal! Updating the Document section with athletic schedules. Games can also be found in Events. Changes to the schedule will be updated on Events and last minute changes will be posted on Live Feed and Social Media. .
First football game tonight, info within app for directions. Come support our students. Also reminder no school Monday. Thanks for the good turn out at ice cream social. High School Students - if you are NOT a senior, please start parking behind the school. Front parking is for seniors, employees and visitors. Thank you. 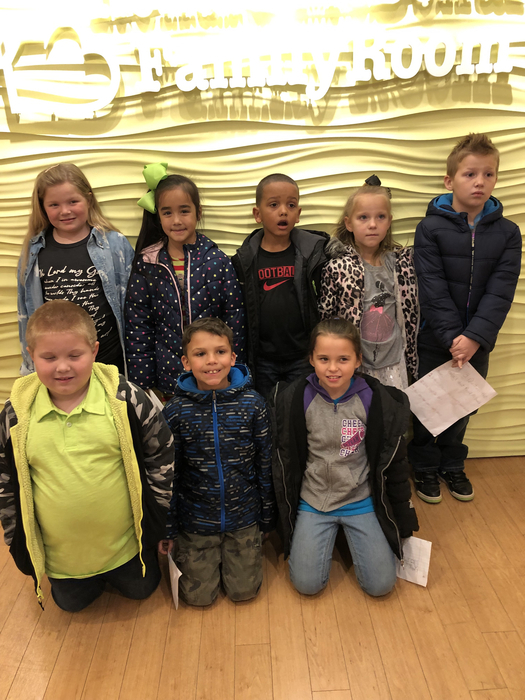 Picture day is coming! Fall portraits will be taken on September 10th. 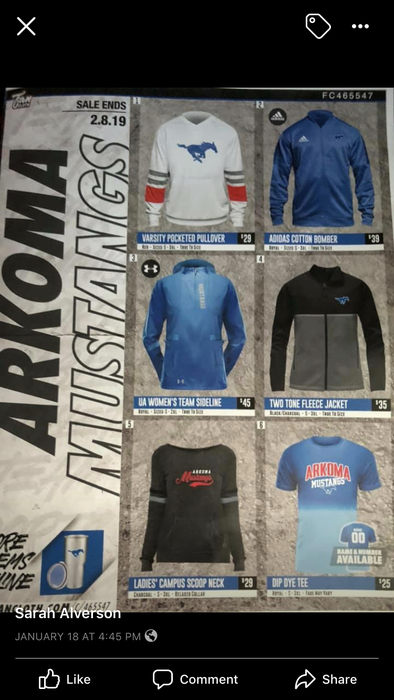 HIGH SCHOOL STUDENTS - Sept 5th Balfour will be at Arkoma High School for students to order Letter Jackets. $100 deposit required. Lady Mustangs has a tough loss to Gans 4-3. JH Softball game vs McCurtain today CANCELLED!